Posted on Thu, Feb 2, 2012 : 4:55 p.m. The “Sesi Motors/WEMU-501 series” will feature the Ben Jansson Quartet at the Ravens Club on Friday, beginning at 5:01 p.m. The shows run the first Friday of every month through June. Tenor saxophonist Ben Jansson has been making the rounds lately as a premier sideman, playing originals, and interpreting the music of Thelonious Monk among others with his small ensemble. No cover. Ravens is at 207 S. Main St., Ann Arbor. 734-214-0400. 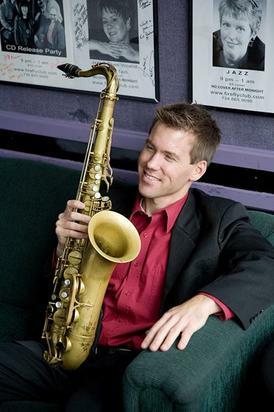 The Ben Jansson Quartet performs Friday at The Ravens Club in downtown Ann Arbor. Enjoy the “(un)Corked Winter Warmer-Wine Tasting” at the Ann Arbor Art Center on Friday. 7 to 9 p.m. There will be a selection of more than 40 wines for your enjoyment and some hearty hors d'oeuvres. $40. The AAAC is at 117 W. Liberty St., Ann Arbor. 734-994-8004 x101. There will be an ”Un-Valentine Concert” at Green Wood Coffee House on Friday that will feature some great local talent. 8 p.m. What started as a one-off evening of laughs, healthy cynicism and fine music has formalized into an ongoing event featuring John Latini, Jamie-Sue Seal, Andre Villoch and Dave Boutette. $12. Green Wood is at 1001 Green Road, Ann Arbor. 734-665-8558. The Ann Arbor “Re-Skillling Festival” returns to Rudolf Steiner High School on Saturday. Registration begins at 9:30 a.m. Classes start at 10 a.m. Learn skills for resilient, low-energy living. Learn winter skills, which may include sessions such as sock darning, bread-making, cold-weather commuting and planning and preparing for spring gardens. Free admission. Materials fees apply for some sessions. Rudolf Steiner is at 2230 Pontiac Trail, Ann Arbor. 734-669-9394. “Winter Warriors” need only apply at the Arbor Brewing Company on Saturday. Noon to 5 p.m. The patio is open for guests to enjoy $1 draft beers and help forget the cold with hot beverage and chili specials to warm you up. ABC is at 114 E. Washington St., Ann Arbor. 734-213-1393.